Below is the complete newsletter just released by the International Coalition to Free the Angola 3. Please help spread the word! "Erica, our neighbor/7th Ward mom is doing a fish fry on friday- and cooking all the food here at our house- I would propose also to make that a venue, and spend $6 a plate for homegrown happiness? IT'S SO NICE TO BE HERE RIGHT NOW, ISN'T IT?" We couldn't agree more - here's to our fabulous supporters in New Orleans!!!!! 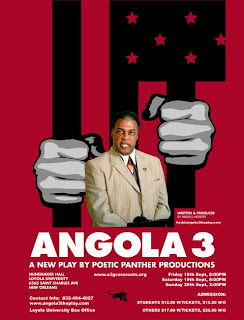 As announced on Loyola University's website, the Loyola University New Orleans College of Law chapter of the National Lawyers Guild presents the play "Angola 3" this Friday and Saturday, Sept. 18 and 19, at 8 p.m., and Sunday, Sept. 20, at 2 p.m., in Monroe Hall's Nunemaker Auditorium on Loyola's main campus. A reception will be held on Friday at 7:15 p.m. before the performance. Please help by supporting the play. Playwright Parnell Herbert was recently interviewed on You Tube and Blog Talk Radio. Read more at angola3news.com. Featuring former BPP members Billy X Jennings and Malik Rahim; Jackie Sumell of "The House That Herman Built"; Robert King, a member of the Angola 3 who was released in 2001; and a screening of the movie "The Angola 3: Black Panthers and the Last Slave Plantation." Featuring former BPP members Billy X Jennings, Malik Rahim; Jackie Sumell of "The House That Herman Built"; Robert King, a member of the Angola 3 who released in 2001; and a screening of the movie "The Angola 3: Black Panthers and the Last Slave Plantation. The Southeastern Louisiana University Student Union complex will be the location of a major regional event on Thursday, September 17th, when the Southeastern Sociological Association student organization hosts an event supporting the release of Albert Woodfox and Herman Wallace, the two remaining incarcerated members of the Angola 3. Originally targeted as Black Panther Party members for successfully organizing the prisoners at the infamous Angola Prison in the early 1970's to stop prisoner-to-prisoner violence, Woodfox and Wallace were framed for the murder of a White guard in 1972 and placed in 6' X 9' single cells for 23 hours per day ever since. A visit from U.S. Representative John Conyers, chair of the House Judiciary Committee, in 2008 garnered the two men several months in a specially designed dorm, but they have since been returned to their earlier conditions. Human rights organization Amnesty International has reported that the two may have now been held in solitary confinement longer than anyone of whom they are aware in any country ever. "Even after a State Judicial Commissioner recommended the reversal of Wallace's conviction because of prosecutorial misconduct and despite Woodfox' conviction being overturned twice now, both men remain in solitary confinement yet," said Rebecca Hensley, S.S.A. advisor and sociology instructor at the University. The event will feature award-winning documentaries and internationally-recognized speakers, including author and activist Robert King, who as the third member of the Angola 3, was released in 2001 after himself spending 29 years in solitary confinement. Besides calling for the immediate release of Woodfox and Wallace as a long overdue act of simple justice, however, the students will also use the event to celebrate the survival of the two activists by serving jambalaya and dancing to the music of a reggae band. Formal presentations will occur in the Student Union and other activities will occur in the area of the Union from 10:00 a.m. until 4:00 p.m.
A related event is the world premier of "Angola 3," a new play by award-winning playwright Parnell Herbert, opening at Loyola University Nunemaker Hall at 8:00 p.m. on Friday, September 18th, and showing on Saturday, September 19th, at 8:00 p.m. and Sunday, September 20th, at 2:00 p.m.
--Listen to the September 10, KBOO Radio show here.